The ‘plant of immortality’, as it was called by Egyptians, also known as ‘Ghritkumari’ in Hindi, ‘Kalabanda’ in Telugu, ‘Katralai’ in Tamil, ‘Kumari’ in Malayalam, ‘Lolisara’ in Kannada, ‘Koraphada’ in Marathi, and ‘Ghrtakumari’ in Bengali can perform miracles not just for your skin, but for your hair and health as well. Wrinkles and fine lines are bound to appear as you age. But, other factors may expedite what is a natural process. Aloe vera helps in preventing these early signs of aging. As your skin ages, it tends to get drier and loses its elasticity. This makes it more susceptible to wrinkles and fine lines. Aloe moisturizes the skin, and it also helps remove dead cells. In fact, research has proven that aloe vera improves the elasticity of skin and makes it smoother and more supple (1). Aloe vera gel has been touted by many as their go-to moisturizer. It has shown miraculous effects on oily and acne-prone skin. Aloe vera gel can be directly extracted from the plant and applied to your skin. Alternatively, there are plenty of ready-to-use aloe gels available in the market. 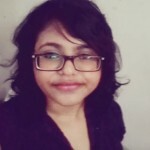 But if you are opting for them, make sure that the aloe vera gel in it constitutes 90 to 100 percent of the product. Gently massage the gel on your face. Store the rest in the refrigerator to prolong its shelf life. Aloe vera increases the water content in your skin, and leaves it hydrated without making it greasy (2). Aloe vera mixed with a few drops of lemon juice, can help in the reduction of acne and acne scars. Adding lemon juice is important because lemon possesses skin lightening properties that can help with blemishes (3). Add the lemon juice to the aloe vera gel and combine them together. Aloe vera is an antibacterial and anti-inflammatory agent because of the presence of gibberellins and auxins. This helps reduce your acne. It also contains polysaccharides that stimulate the growth of new cells. This speeds up the healing process for acne and prevents scarring (4). The use of lemon can increase your sensitivity to the sun (5). Using a sunblock before stepping out in intense sunlight is advisable. Aloe vera, owing to its anti-inflammatory properties, reduces the redness brought on by exposure to UV rays and soothes the skin (6). It acts on the epithelial skin layer and provides a protective layer to the skin for retaining moisture. Since aloe vera contains a lot of antioxidants and nutritional properties, the skin is able to prevent the moisture from escaping, which in turn heals the sunburn quickly. 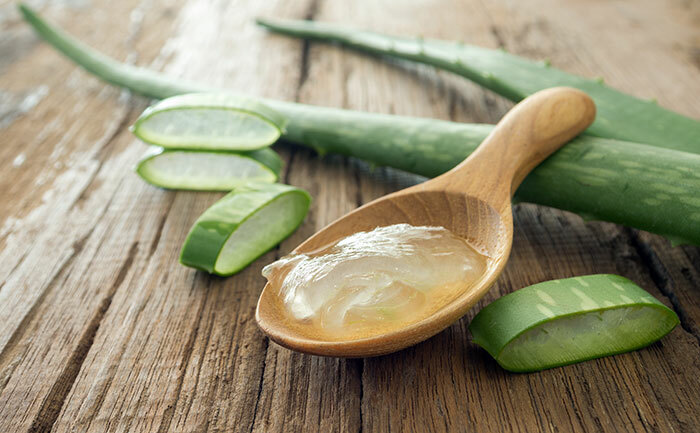 Aloe vera gel can be used as a topical treatment for small cuts, bruises, and insect bites. It can also be used as an aftershave lotion to soothe irritated skin. With the passing of age, our skin expands and contracts just like elastic. When the skin stretches very far, like during the pregnancy or due to rapid weight gain, the elasticity of the skin gets damaged, which results in ugly stretch marks. These marks are nothing but small tears on the skin layers, which can be healed with the regular use of aloe vera soap. 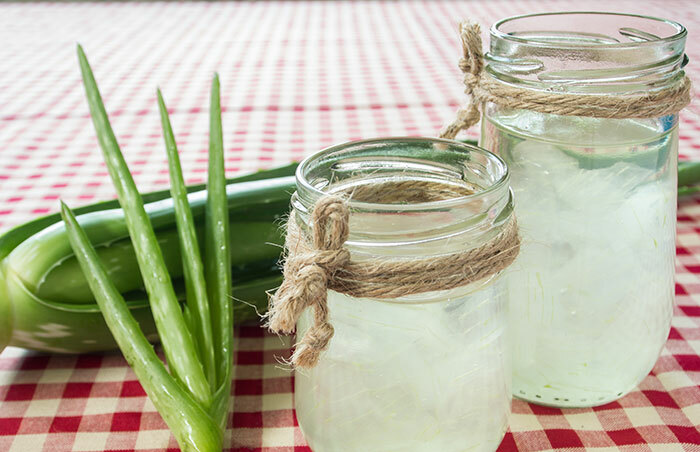 Aloe vera is not just great for your skin; it also has a number of benefits for your hair. Topical application of aloe vera can help promote hair growth. Aloe vera removes dead cells from the scalp, which allows your hair to grow (7). 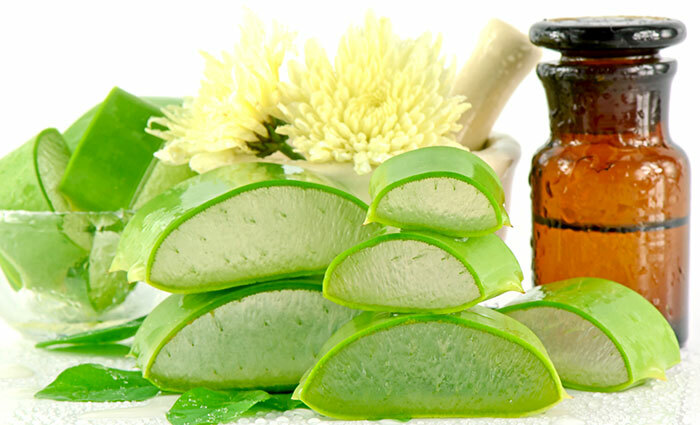 Aloe vera is a widely used ingredient in many commercial shampoos and conditioners. This is because it works wonders for dandruff and dandruff-related problems such as an itchy scalp. Dandruff can be caused by a number of reasons. An oily scalp, accumulation of dead cells, or even an infection can be the cause. And aloe helps out on all fronts. It removes dead cells from your scalp that can clog your hair. It also has antimicrobial and anti-inflammatory properties, which fight against infections and soothe the scalp. When the pH balance of your hair is disrupted, it can lead to endless hair problems. Aloe can help maintain the pH balance of your hair. The pH of your scalp is 5.5, which makes it fall on the acidic side. A lot of the commercial hair products, especially shampoos, contain surfactants which can alter the pH of your scalp and hair because they are alkaline in nature. This can result in damaged and unruly hair (8). Aloe Vera helps restore your scalp’s pH balance, which promotes healthier and better hair. Aloe vera contains proteolytic enzymes that remove dead cells (9). It helps in cell regeneration, which helps repair your hair. It also infuses your hair with moisture, leaving it smooth and glossy. Cut off a leaf of aloe vera. Scoop out the gel, and carefully wash to remove any residual sap. One of the causes for inflammation is oxidative damage, which is caused due to the free radicals in your body that damage your cells. It is common knowledge that aloe vera is rich in antioxidants. These antioxidants bind with the free radicals and help manage the inflammation (10). Aloe vera juice has been used in the treatment of gastroesophageal reflux disease (GERD). GERD causes symptoms such as heartburn, chest pain, and trouble with swallowing, and aloe juice is an effective cure. Aloe vera has anti-inflammatory properties which soothe the stomach lining and the esophagus. It also helps fight against pathogens that cause gastrointestinal problems (11). 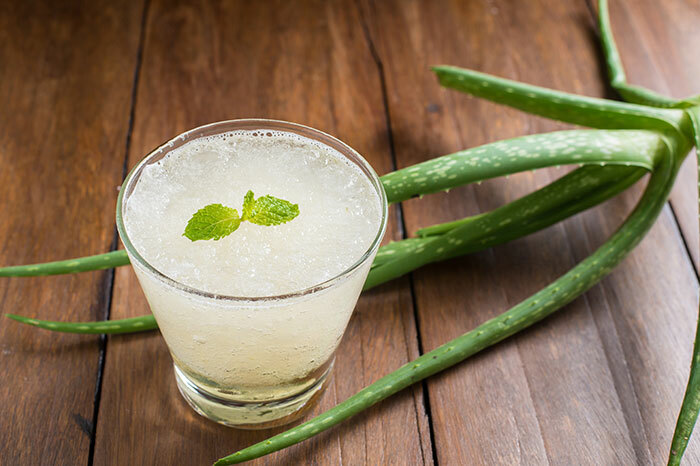 Although it is still in its preliminary stages, research has shown that aloe vera can help reduce cholesterol. It also helps in maintaining blood sugar, which is why it is often used as a supplement by diabetics. Clinical trials have shown that aloe vera can reduce the concentration of cholesterol in your vital organs (12). It can also reduce blood glucose levels. Find some fresh Aloe Vera. You can consider buying Aloe Vera gel, but freshly extracted Aloe Vera gel is more potent, and has no additional chemicals in it. Proceed to extract the gel from the Aloe Vera plant. Chop the mint leaves up finely. Alternatively, you can consider using some eucalyptus essential oil or peppermint essential oil. Aloe vera gel, owing to its antibacterial properties, can help fight against cavity-causing bacteria. It also helps with diseases that cause gum inflammation, particularly periodontitis (13). Aloe vera propels cells to produce nitric oxide and cytokines, which help with your immune system (14). Aloe vera boosts your immune system, which indirectly helps your body fight against tumors. Studies have also shown that it can shrink the size of tumors and increase the survival rate of those with cancer (15). Aloe latex is considered to be unsafe for consumption (16). It can cause gastrointestinal problems, and can be lethal in higher doses. The aloe gel should be avoided by pregnant and breastfeeding women. It may aggravate any intestinal conditions and kidney problems. Aloe vera lowers blood sugar, so diabetics and people who are about to undergo surgery should monitor their blood sugar levels. When it comes to the natural treatment of piles, Aloe Vera is very popular. Its many beneficial properties give this amazing plant the ability to heal this painful condition. Its anti-inflammatory properties diminish inflammations inside and out and help in alleviating bowel irregularities and intestinal problems. It makes stool soft and easy to pass, thereby reducing the pressure brought on by strain. 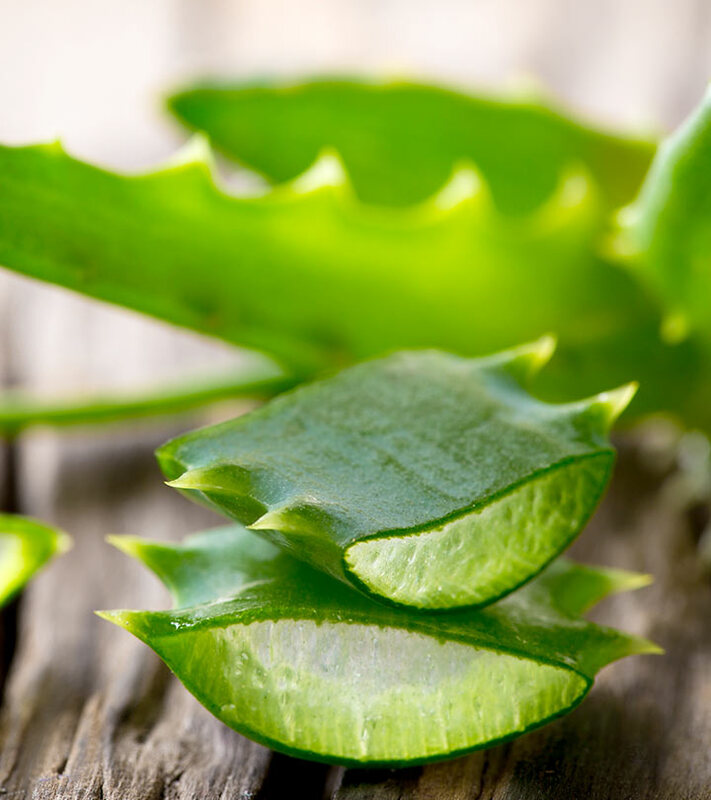 Anthraquinones, one of Aloe Vera’s key ingredients, help in stimulating contractions on the walls of the digestive tract. The gel can be applied as often as required. However, remember not to apply it after a bath, after bowel movements, or before going to bed. Using Aloe Vera topically does not come with any significant side effects. However, consuming it could cause blood sugar levels to go down – so diabetic patients should be cautious if they are taking it as a remedy for piles. The aloe vera plant thrives in hot and dry climatic conditions. So, if you want your plant to grow properly, it is important that the plant receives enough sunlight and warmth. While it certainly needs water, too much of it can actually hamper its growth and cause it to rot. One of the signs that you are watering your plant too much is when the leaves turn yellow. This indicates that the leaves are saturated with water, so you should cease watering the plant for a while. You also should not use fertilizers on the soil the aloe vera plant grows in. Rather than helping the plant, it may hamper its growth. For harvesting the gel, it is best that you use the outermost leaves. They tend to be fleshier than the newer ones, and therefore contain more gel. Make a clean cut with a sharp knife as close to the base as possible. Then, place the leaves upright for a while so that the sap drains out. This is a very important step if you are planning on consuming aloe vera. After the leaves have been cleared of the sap, peel off the outermost green layer. This leaves you with the clear gel, which you can scoop out with a spoon. If you are planning on ingesting the aloe vera gel, do so immediately. For topical application, it can be stored for a longer time in the refrigerator. Always use a sterilized container to store your gel in order to keep it from spoiling. For a longer shelf life, you may add a few drops of vitamin E to it. Aloe vera is a very versatile plant, and all its benefits probably cannot be summed up. Do you know of any more benefits it has to offer? Or interesting things that can be done with it? Do let us know in the comments section below. 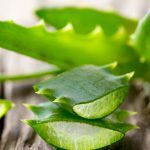 How Does Aloe Vera Help In Treating Acne/Pimples?